Cup of dinosaur pee anyone? It’s interesting to dwell upon the suggestion that the water that you’re drinking today in your café latte was once excreted by dinosaurs! Apart from a little escaping to space as gas, scientists believe that the water on Earth is the same substance that’s been here for nearly five billion years. You may find that hard to believe, but it is harder to dispute the role water has in our lives and the issues we are now facing around managing for it. Water demands respect. Cover surfaces in impermeable material and water starts to act in an unpredictable and dangerous way. It is not necessarily raining more than normal. But rain-water moves into rivers far more quickly when there are fewer surfaces to soak it up en route. Rivers and flood-plains are more confined than they used to be and it is not uncommon for water to burst through banks, overspill ditches and break through dams, dikes and levees. Conversely, creating space for water and designing with water can harness the immense life-giving beauty of water. Slowing it down, collecting it and absorbing it in vegetation and ponds can provide biodiverse-rich habitats for wildlife and people. ‘Every little helps’ is more than just a supermarket slogan. Natural drainage methods, built into gardens, public spaces and the wider landscape really do help to improve the bigger picture. We just need more of them. At the garden scale planted beds, strips, or lawns rather than solid paving and artificial grass are the basic model. If your thirst for knowledge takes you one step further along the earth-friendly shopping isle, there’s the concept of rain gardens that could make huge differences, not only to problem areas but potentially to the entire planet. The idea is completely logical and relatively low-tech. It’s simply designed to make better use of rainwater locally, in order to tackle the problem of surface-water flooding at a regional level. Rain gardens collect water runoff and this is filtered by vegetation, thereby filtering out pollutants. The water percolates into the soil, so this is not a permanent pond – indeed for much of the time it will be dry. The slogan ‘disconnect your downpipes’ encourages people to divert their roof water through the garden to be drained into shallow depressions, which have been designed to deal with water the way that nature intended. These are domestic solutions that many people could incorporate into their gardens. Rain gardens take the strain out of regular watering, provide habitat for wildlife and also look beautiful. Below are two rain garden examples. Got a 20 minute wait in London Victoria? 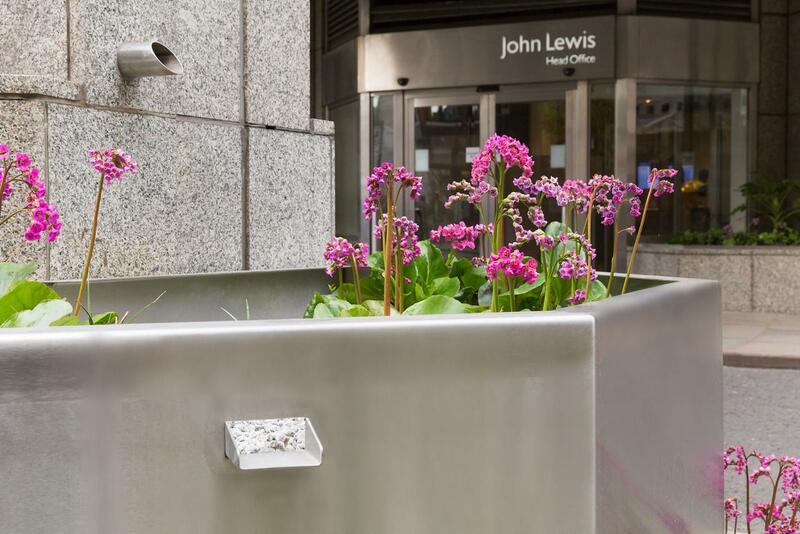 Take a look at the John Lewis Rain Garden just around the corner, next to the front entrance of John Lewis head office. Before it was a garden, it was a barren, uninspiring 75 metre square concrete-cobbled area! Fancy a wild day in London? 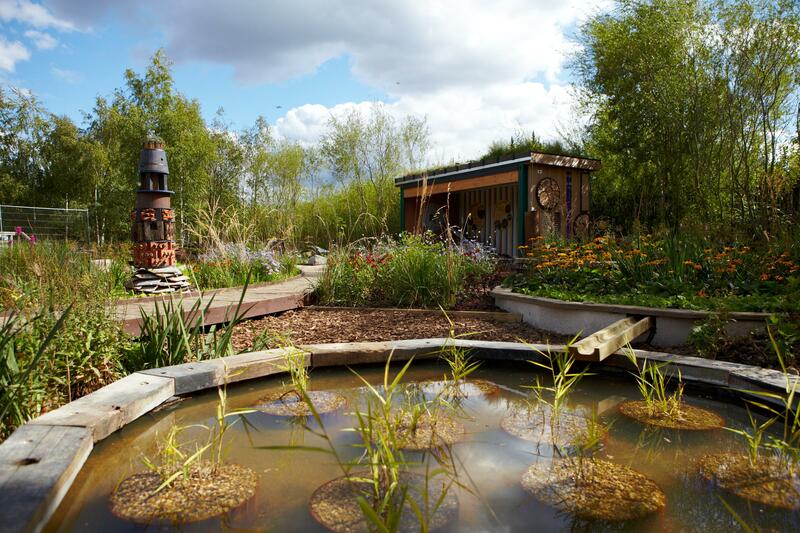 London’s Wetland Centre in Barnes has a fine rain garden (amongst other great wildlife rich habitats) that takes rainwater from the pavilion roof down a gentle slope of landscaped terraces to a pool. A rain gardener in the making? There’s no ‘one size fits all’ approach to rain garden. Plants need to be selected according to aspect, taking into consideration shade, sun and factors such as salty, seaside air. But as gardeners will know, experimenting with your materials (once you know the basics) is the path to scientific discovery! To get you started some of the suitable species able to withstand both wet and dry conditions include the genus: Acanthus, Asters, Astilbe, Bergenia, Brunnera, Carex, Cornus, Crocosmia, Eupatorium, Hemerocallis, Hosta, Iris, Kniphofia, Lythrum, Miscanthus, Monarda, Persicaria, Rudbeckia, , Sanguisorba, Scabious. Caroline Knight is a garden designer having graduated in Garden Design in 2013. She leans towards contemporary design and feels strongly that modern materials, planting and nature can complement each other harmoniously provided there is enough thought behind the design.